We provide access door with glass window at fan section for monitoring and servicing fan and motor. Marine lamp is also provided which is electrically connected with limit switch, whenever door is opened it turned on which ease in better visibility. Above selection are done by our highly qualified and experienced design team with help of latest selection software for coil and fans, so that you get the best AHU in the Market. 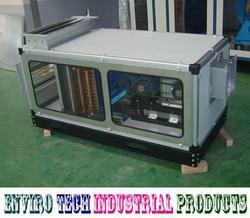 We provide you “low leak cabinet” design which you’re providing cooled air to the intended space only. 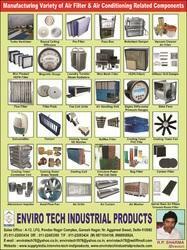 ENVIRO TECH INDUSTRIAL PRODUCTS is the company promoted in India by the Executives having a combined experience of more then 19 years in the filter & Air Conditioning industry. 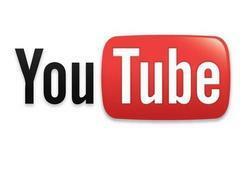 The company was started its operation in India in November 1995. 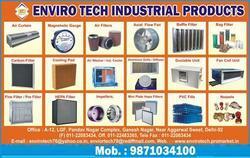 We, Enviro Tech Industrial Products are a reputed name for Manufacturing Variety of Air Filters & Air Conditioning Related Components. By providing clean air solutions to a large number of customers from power generation, refineries & petrochemicals, engineering, pharmaceuticals, food, beverages and allied industries, we have earned recognition in the market. The product range of industrial filters, we offer include Air Filter, Pre Filter, Fine Filter, Hepa Filter, Mini Pleat Hepa Filter, Bag Filter, Hi-Tem. Hepa Filter, Air Pipeline Filters, Gas Pipeline Filters, Liquid Pipeline Filters, Pocket Filters, Vacuum Filters, Hvac Filters, Wire Mesh Filter, Fuel Filters, Microvee Filter, activated carbon filters,Rod Type Filter,Rod Type Pre Filter,AHU UNIT,Air Curtain,Air Washer,Axial Flow Fan,Cellulose Paper Pad, Fan Coil Unit, Fresh Air Unit,Grill,Damper, Diffusers, Pressure Relief Damper, Motorized Dampers, Acrylic Inclined Manometer,Magnehelic Gauge, Pass Box, Cooling Tower Fan Hub, Cooling Tower Motors, Cooling Tower Packing Pall Ring, Cooling Tower Sprinkler,Cooling Tower Fan, Cooling Tower Spray Nozzels,Cooling Tower PVC Fills,Air Shower,Laminar Flow Bench,Sampling Dispensing Booth, Our company works under the leadership of Mr.R.P.SHARMA . Air Conditioning, Showroom, Shopping Mall, Restaurant & Bar, Hotels, Office, Call Centre, Building, Schools, Studio, Institute, Hospital, Pharma company, Clean Room, etc. "Ethics" & "Transparency" are pillars of our business value system. 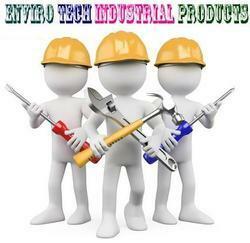 We, ENVIRO TECH INDUSTRIAL PRODUCTS are a reputed name for Manufacturing Variety of Air Filters & Air Conditioning Related Components.By providing clean air solutions to a large number of customers from power generation, refineries & petrochemicals, engineering, pharmaceuticals, food, beverages and allied industries, we have earned recognition in the market. The product range of industrial filters, we offer include Air Filter, Pre Filter, Fine Filter, Hepa Filter, Mini Pleat Hepa Filter, Bag Filter, Hi-Tem. Hepa Filter, Air Pipeline Filters, Gas Pipeline Filters, Liquid Pipeline Filters, Pocket Filters, Vacuum Filters, Hvac Filters, Wire Mesh Filter, Fuel Filters, Microvee Filter, activated carbon filters,Rod Type Filter,Rod Type Pre Filter,AHU UNIT,Air Curtain,Air Washer,Axial Flow Fan,Cellulose Paper Pad, Fan Coil Unit, Fresh Air Unit,Grill,Damper, Diffusers, Motorized Dampers, Acrylic Inclined Manometer, Magnehelic Gauge, Pass Box, Cooling Tower Fan Hub, Cooling Tower Motors, Cooling Tower Packing Pall Ring, Cooling Tower Sprinkler,Cooling Tower Fan, Cooling Tower Spray Nozzels,Cooling Tower PVC Fills,Air Shower,Laminar Flow Bench,Sampling Dispensing Booth Our Company Works under the leadership of Mr.RP.SHARMA .